There are too many stains, processes, types of finishing equipment, finishing techniques, and products and processes to write about them all. Our attempt here is to discuss some basic ideas that will assist the finisher in achieving the desired look of finish on European Beech. All wood is (hygroscopic) and will absorb stains and finishes differently depending on the porosity and cell structure of the wood species. Some hardwoods like Hard Maple resist the absorption of stains as the grain structure is tight and interlocking and cells are small. Some hardwood like European Beech, although it is as hard as Hard Maple, has larger pores and does not have tight interlocking grain. Both species are contemporary, closed grain woods that sand smooth, finish to a high polish and do not look “heavy grained” when stained or finished like open grain hardwoods such as Oak. Since Hard Maple doesn’t take stains deeply and requires multiple coats, it will lose almost all signs that it is wood. The stain will hide the grain, especially on darker finishes. European Beech on the other hand, even though it sands to a high polish, will absorb more stain and will show the grain of the wood, even on darker finishes. If the desired look is to mute the grain, using a sanding sealer to fill the pores of the wood would allow European Beech to achieve that look as well. 2) Protect it from gaining moisture. 3) To enhance the color and grain of the wood and to bring out the natural beauty and enhance it with color. Books have been written on this topic. Many problems can be traced back to poor preparation. Following are some basic steps to remember. 1) Make sure to use good quality sandpaper.Carbide is the best. For European Beech, we have been told that water-based dye stains work the best as the look is more uniform and it will not look blotchy or gritty like oil-based wipe-on/wipe-off stains. The most common problem is the blotchy or gritty look oil stains leave when the stain is wiped off leaving the asphaltom or gilsonite (dark tar based colorants) lodged into the pores of the wood. This also causes the grain to “POP”. Spray, no-wipe will minimize or reduce the grain pop or gritty, blotchy look. Colorants that readily flow into the grain and wipe off cleaner will have more grain definition such as asphaltom, gilsonite and transparent oxide colorants. Other colorants may penetrate the hardwood better and do not wipe off as clean, which produces less grain definition. Also, lower viscosity stains tend to have more grain definition and higher viscosity stains tend to have less grain definition. Factoring in a spray application, and in-house color matching, staining cost in labor and material may be lowered by 30% or more. Make only the amount of stain you need, further cutting costs by minimizing waste. Making the stain where you need it, “on time”, no longer relying and waiting on an outside supplier. Many existing colors can be matched with the Hydro stains. For Beech and Maples, European Hydro stain technology is considerably more uniform than any wiping stain. In many cases, deep colors are achieved in one step rather than two. Dry times of Hydro Stains are twice as fast as the fastest wiping stain. Hydro stains are “green”; V.O.C.’s from staining would be virtually eliminated. Hydro stains achieve maximum uniformity on difficult to stain woods such as Beech and Maple. Pre-treatment of these woods would be eliminated. Because wood is made with water, Hydro stains have a natural relationship with wood, and therefore are the most user friendly of spray stain applications. Hydro stains are compatible with most finishes. Not all stain effects can be replaced with the Hydro stains. Open pore woods such as oak and hickory achieve maximum grain strike with wiping stains. NOTE: Optional specialty colors may be offered with the use of Hydro stains as a Pre-stain under solvent wiping stain. This achieves the deepest of colors with clarity, uniformity and definition. Conventional application of stain is generally applied by a “spray and wipe” process using solvent base stains. The stain is sprayed on, wiped off, and then must dry. As a wiping stain, it must be formulated to dry slowly, or what is known as an open time, to enable time to wipe the stain evenly. Wiping stains require relatively little training. Heavier pigments in these stains enhance the grain in open pore woods such as oak and hickory, producing a strong grain strike. Wiping stains on woods such as beech, maple and birch usually require a pre-treatment to reduce blotchy results; this step adds additional labor and material V.O.C.’s. 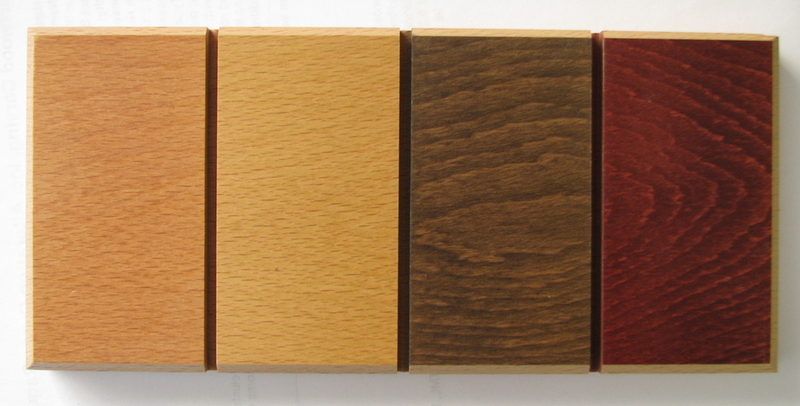 From solid woods to veneers, uniformity of color is not always even. Application of a wiping stain takes 3-4 times longer than spray only stains. Dry times may vary from 45 minutes to several hours. Deep colors usually require an additional color step such as a spray only pre-stain. Solvent base wiping stains are the single highest exposure of bodily contact to toxic fumes. Fumes are absorbed not only through the lungs, but also through eye membrane and the skin. Bleed back of stain from pores and crevices between frames and panels is a common occurrence requiring the additional labor for re-wetting and removal. Solvent base stains are toxic. They are some of the highest in V.O.C.’s of all finishing products. Wiping stains must be removed by hand; rag marks and hand prints are inevitable, costing time and money to repair. Solvent base stains are not considered ‘green’. Solvent base wiping stain rags produce waste. Used rags are flammable and a common reason for shop fires. Rags leave behind cotton fibers in the wood, which must be sanded out of the finish. Used rags must be dried and disposed of carefully. Much of the wiping stain is wasted. As much stain is left in the rags as in on the wood. What is the difference between your products and what is at my local store? We invite you to explore our carved wood Products section. When you see and handle our products you will be impressed by the quality of our woods and the sophistication of our designs. At Heartwood, we carve solid wood compared to the common board or mdf embossed products available at your local store and have a much larger selection of designs. If you have other questions, whether they be about ornamental carvings, architectural details, or any other wood carving-related questions, please contact us. We encourage our customers and website visitors to find out more about us. Customer service is our top priority! In 2015 UPS revised its shipping rate structure to account for larger boxes with no weight, call a "dimensional" weight. As a result Heartwood has been required to try to discern box sizes for every possible order. This is not possible, so we assume conservatively that each order will use the largest size box that item requires. When it comes time to actually ship the parts, we check the rates against those charge and if the charges are not in line we will refund the difference to at that time. If you are concerned about any shipping rates, please give us a call and we can usually state a pretty close charge. Do you ship PRIORITY MAIL? Yes, we can. Just specify in the comments section of your order that you would like us to ship US POST and as long as the box fits their requirements we will ship that way. Keep in mind that US POST cannot handle certain sizes and for this reason is not our default choice. What level of design assistance do you provide? We are happy to give recommendations for which of our products will be best suited to the area you want to fill. Because we create components and not full installations we are not suited to design and entire project such as an entertainment center, kitchen, bar etc. We do provide full design services for custom components and are pleased to offer suggestions on size, design, and wood etc. on how the component will best suit the area where it is to be installed. How can I get a custom quote and what information should I send? For a quote on a custom piece please visit our CUSTOM page where you can choose what type of customizing you would like and submit photos. For Photos we prefer multiple angles in good light (with no flash if possible) so that we can have as much visual information on the piece as possible. If you don't have photos a sketch and description will do. Please tell us if you are seeking a piece that is as exact as possible or work that is simply inspired by the original as this will affect design costs and what type of source material we require to create a 3-D computer model. Once the quote is approved we will confirm all the final details of quantity, dimension, wood type etc. When the 3-D model is complete we will send multiple views of the 3D model for your approval before we carve your custom piece. What wood types do you use? All of our products are available in nearly any wood. Our standard offerings are Alder, Cherry, Red Oak, Maple, Mahogany(African Sapele) and Walnut, European Beech is used for paint and stain grade, however for paint grade we may substitute for any non-porous wood above. As wood is a living resource, color and grain may vary. Heartwood Carving is committed to the use of sustainable wood and to providing our clients with high quality FAS graded stocks that have been hand selected at our facility. How do I know which wood to choose? Each wood species will behave differently under different lighting conditions and may age and change with exposure to light and moisture. We encourage you to examine some hardwoods from your local supplier before making your final selection. If our product will be placed on or near other wood then using the same wood type is best, but if you are staining then using a wood in a similar color family usually works fine and works even better if you are using a dark stain. Can I provide my own wood for you to carve? Yes, we will work with customer wood but it is not our preference. Producing ornate carved wood is a complex process where errors can occur or unexpected irregularities in wood can exist that are only discovered when carved. By using our large stock of wood we are able to carve additional pieces as necessary. This is not often possible with a limited quantity of client stock. Because wood is a natural product there can be a lot of variation within each species. If you specify light/darkness, pore tightness and grain or if you are able to provide a small sample we are often able to source similar stock. We understand that carved wood is an investment in a home and how important it is to create a cohesive look. This can be greatly affected by grain and color especially when using a clear coat or light stain. Using client sourced wood is the best way to ensure that Heartwood components will exactly match others in an installation so we are happy to work with customer wood as needed. When choosing this option we ask that the pieces provided be wider and longer than the dimensions of the finished pieces so that we have enough wood for affixing the pieces to the CNC table for machining. What type of finish will my piece have? All Heartwood products arrive unfinished unless stain or lacquer is specially ordered, at an additional cost. All carvings are cleaned from fuzz and machine artifact ready for your final prep and finishing. Often Heartwood's components are installed along with wood pieces sourced from elsewhere and because stain colors and applications vary it would be difficult to make pieces match. Batch staining all pieces or staining new pieces on site to match existing installations is the best way to maintain a cohesive look. What type of stain or finish should I use? The type of stain or finish depends on a number of factors including the type of wood and the look you want to achieve. We have found lacquers, wood oils, polyurethanes, latex or oil paints all have their advantages and disadvantages. They can all commonly be found at your local home improvement or wood crafting store which provide plenty of information for each product. With whatever product you choose we encourage you to TEST TEST TEST. This will save you valuable time and money. If you are still unsure consult a carpenter or other wood professional in your area. What is the best lighting for carved panels? The look of carved wood will vary in different light. In the case of carved murals or carved doors, special attention to lighting will pay big dividends in the appearance and impact of your carved piece. In most cases a lighting angle of 15 to 30 degrees will give the most dramatic look. If possible, experiment by having someone hold a light above your carving at a time when the light in the room is subdued. You should be able to easily determine the best angle for your installation. Can you make period moldings? We can reproduce custom period moldings directly for short runs (100-200') or we can offer the services of an established millwright, Architectural Millwork and Manufacturing here in Eugene, Oregon, www.archmillwork.com for larger order requirements.